Mouse study suggests that mutation to FOXP2 gene may have helped humans learn the muscle movements for speech. Our statistical tests of alternative Semitic histories support an initial divergence of Akkadian from ancestral Semitic over competing hypotheses (e.g. an African origin of Semitic). We estimate an Early Bronze Age origin for Semitic approximately 5750 years ago in the Levant, and further propose that contemporary Ethiosemitic languages of Africa reflect a single introduction of early Ethiosemitic from southern Arabia approximately 2800 years ago. 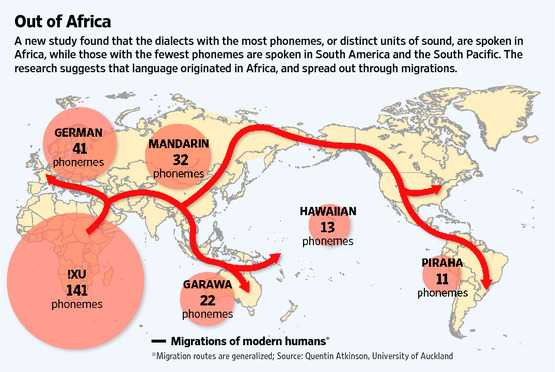 Related here: Linguistics links – https://eikonal.wordpress.com/2010/08/07/linguistics-links/ | Learning languages / Language acquisition – https://eikonal.wordpress.com/2010/11/12/learning-languages-language-acquisition/ | Bilingualism – https://eikonal.wordpress.com/2010/11/12/bilingualism-multilingualism/.